This week, I’ve spoken to a jewellery expert who shared her top tips with me to help you choose your perfect wedding rings. 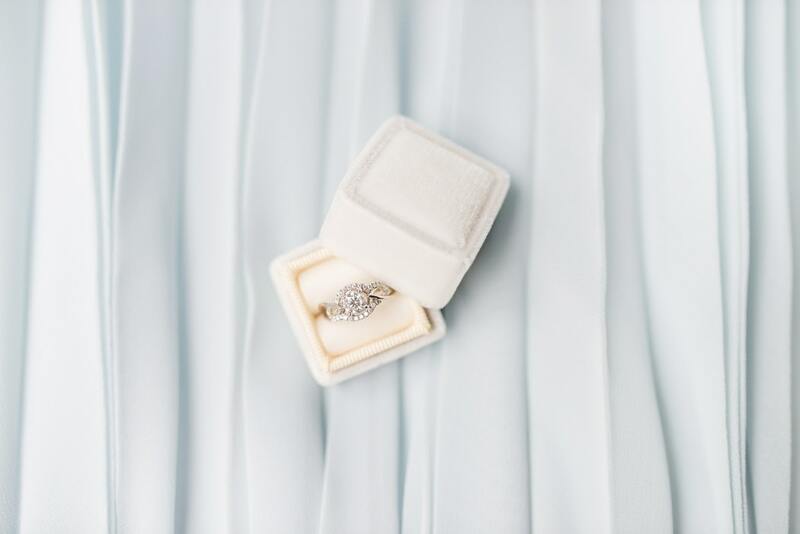 You’ll already have a stunning engagement ring to show off on the big day, But it’s now time to search for your dream wedding ring to complement it. Emily Tebbutt, the Jewellery Commercial Manager at Ramsdens shares her top tips for picking the perfect wedding ring. Wedding planning can be extremely exciting but, with so much to think about, it can also seem a little daunting. From finalising the guest list to setting the theme and choosing a dazzling wedding dress, it can be easy to neglect the little details. But, when it comes to picking your dream wedding ring, you’ll need to give the process sufficient thought. To ensure you choose one that will be right for you, there are a couple of things you should consider. 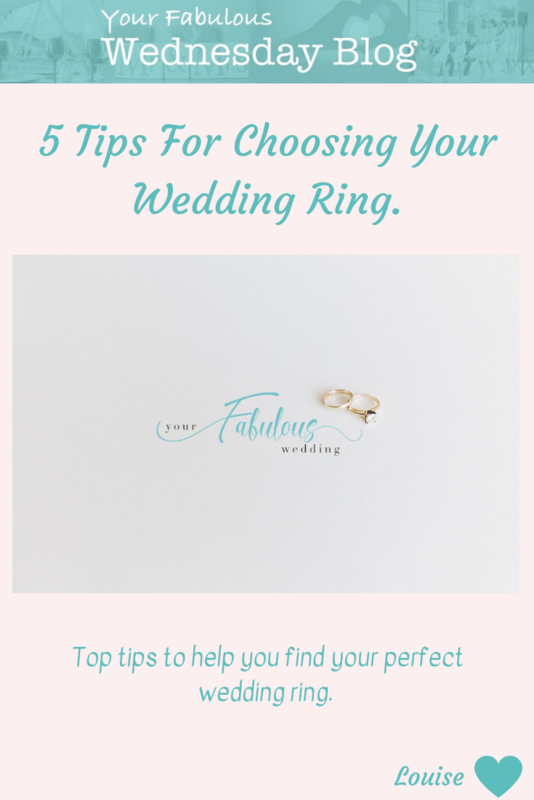 In this article, I will be highlighting these and sharing my top tips for choosing the perfect wedding ring. Before you begin the search for your dream wedding ring, you’ll need to be realistic about what you can afford. Your budget shouldn’t just include the outright cost of the ring. You also need to consider any adjustment costs and maintenance it will need, like regular cleaning in the future. The type of metal you choose will determine how expensive it will be, as will the setting, size, cut and clarity of the stone you pick. So, it will be useful to research how much similar rings cost. And determine which factors you consider to be a priority and which you can compromise on. There is no set amount you should spend on your wedding ring. But many people choose bands which don’t include precious stones, so these are typically cheaper than engagement rings. You’re bound to already have a basic idea of what ring style you want before you begin a proper search. However, it’s worth thinking about more specific details before you go shopping. For example, do you want to go with a standout style or an understated one? You should also be thinking about what type of stone you’ll want (if any) and what shape this will be. It’ll also be worth thinking whether you want it to match your engagement ring. To keep it cohesive, I recommend ensuring both rings are made of the same metal. If your engagement ring has a single diamond on a plain band, your wedding band could have diamonds embedded in it for some subtle coordination. 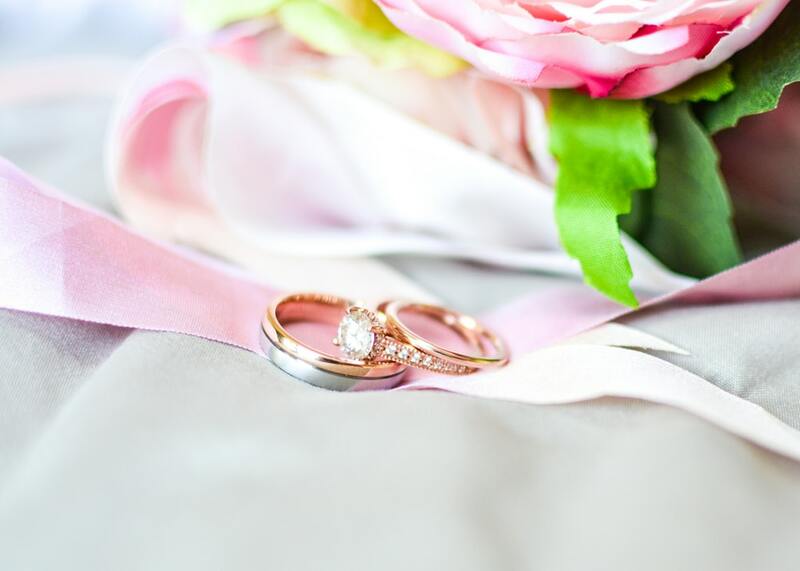 Getting caught up in preparations for the big day is done all too easily, but beginning your ring search well in advance will mean it’s all sorted and ready to go with plenty of time to spare before your wedding. 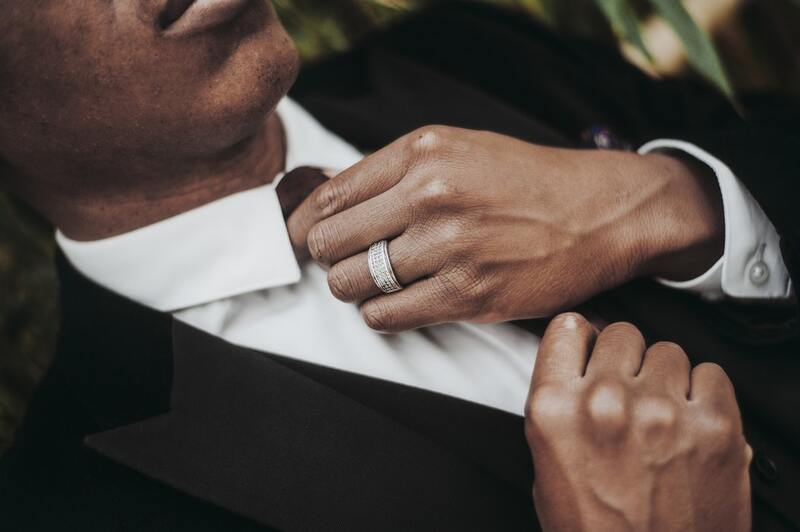 This is particularly important if you’re planning to get a tailormade ring as this can take a couple of months depending on the intricacy of the design or the materials being used. You’ll also need to allow extra time for any size adjustments and engravings you wish to have done. Getting the biggest, highest set diamond might seem like an appealing idea at the time. But if you’ve got a busy hands-on job, it might not be the best idea. These types of rings will attract dirt, dust and debris easier, meaning they will require more time for cleaning and maintenance than others would. If you play a lot of sports, you might want to opt for a simple band with rounded edges to stop it from getting caught or affecting your performance. If you’re very active, you’ll need to invest in a durable metal that won’t get scuffed and scratched as easily, like platinum. Checking for quality is an important part of the wedding ring buying process. You need to be assured that your ring will last a lifetime, and a hallmark will indicate that steps have been taken during manufacturing to ensure that this is the case. Hallmarks consist of three stamps; the maker’s or sponsors mark, the standard mark and the assay office stamp. The retailer you buy from will be able to provide more information about these, so don’t hesitate to ask them if you don’t understand what these mean. Finding your perfect wedding ring will add an extra special touch to your big day, so giving it some proper thought is important. Follow my top five tips and you’ll soon have a ring to cherish for many happy years to come. So thank you Emily for your tips – I hope you found them helpful. You may find my blog about ‘your engagement ring on your wedding day‘ helpful too as you ahead towards your wedding day. And if you need more 1-1 help with your wedding plans, have a look at my wedding services and do get in touch. There are lots of ways I can help and I’d love to hear from you.